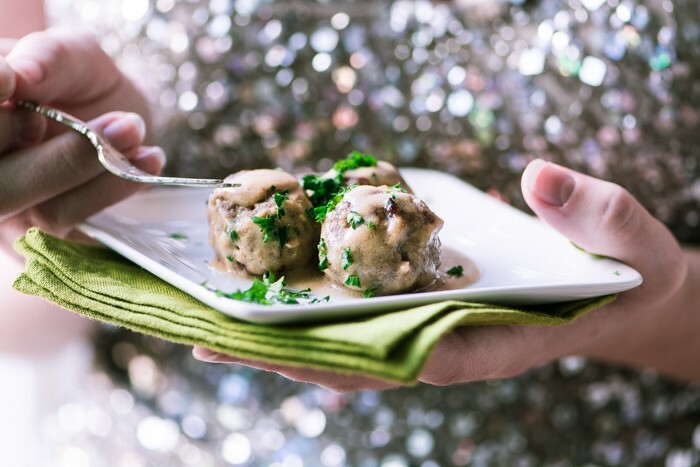 Swedish Cocktail Meatballs ~ tender 'Mad Men' era meatballs smothered in rich gravy ~ the ultimate holiday appetizer that you can whip up in under an hour! Put all the meatball ingredients (everything except the olive oil) in the bowl of a stand mixer (or a large mixing bowl if doing by hand.) I like to break apart the meat as I add it to the bowl. Blend the mixture until all the ingredients are completely incorporated. Form small 1 inch balls, I like to use a 1 inch scoop to portion out the meat evenly. Gently roll them round with the palms of your hand. Preheat the oven to 375F. Coat the bottom of a heavy skillet with olive oil and heat on medium high until hot. Brown the meatballs on all sides, working in batches so as not to crowd the pan. Do this gently, the meatballs are delicate. Set the meatballs on a baking sheet. While the meatballs are baking, make the gravy. Melt the butter in a clean skillet. Stir in the flour and cook for a minute, stirring constantly. Do not allow it to brown. Add the Swanson Organic Beef Stock while whisking or stirring constantly, and bring the mixture up to a simmer. Turn down the heat and add the sour cream, soy sauce, salt, pepper, nutmeg, and parsley. Taste to adjust any of the seasonings. Add the meatballs into the sauce, and then serve hot, garnished with parsley.